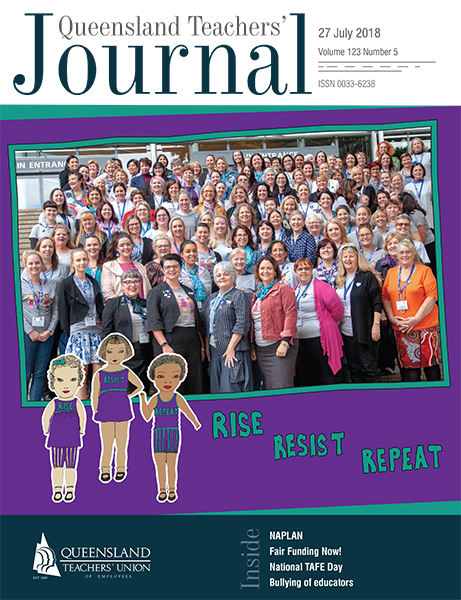 The QTU restructuring at the beginning of 2018 created an opportunity for a new office serving QTU members in the Union’s Logan Redlands and Metropolitan South regions. And after a few months of setting up our new work space early in 2018, the QTU Springwood office was officially opened on 26 May by the local State Member of Parliament Mick de Brenni. The official opening of the new QTU office was held following the Area Council meetings of our two regions and was attended by QTU activists from across our regions, including Area Council delegates, State Council delegates, Lead Union Reps, Principal Union Reps and Executive members, as well as Union Officers and local politicians from within the two regions. We began with a welcome to country by local Logan elder Aunty Peggy Tidyman, who unveiled a plaque recognising the traditional custodians of the land on which the office is located. We then invited Mick de Brenni, as the local MP, to say a few words and unveil the opening plaque to celebrate this momentous occasion. The new Springwood office includes a reception area, two office spaces for the Logan Redlands and Metropolitan South Organisers, an interview/small meeting room, and a larger training area that can accommodate around 30 people and features interactive display technology that can be used during training. The office training space will be available for use by local QTU members and workplaces, as well as other unions and community groups in the area. The Springwood office opening was a fantastic opportunity to celebrate all the work that QTU members and activists continue to do in both the Logan Redlands and Metropolitan South regions, as well as a very tangible symbol of the ongoing growth of QTU membership across the state, which has made this new facility for the benefit of local QTU members possible.